Tyrophagus putrescenti are also known as the common mold mite. These were raised on human whiskers in a humidity cabinet over a saturated solution of sodium chloride. These mites are often found in homes, are strongly allergenic, but are not detected by the common mite allergen tests. 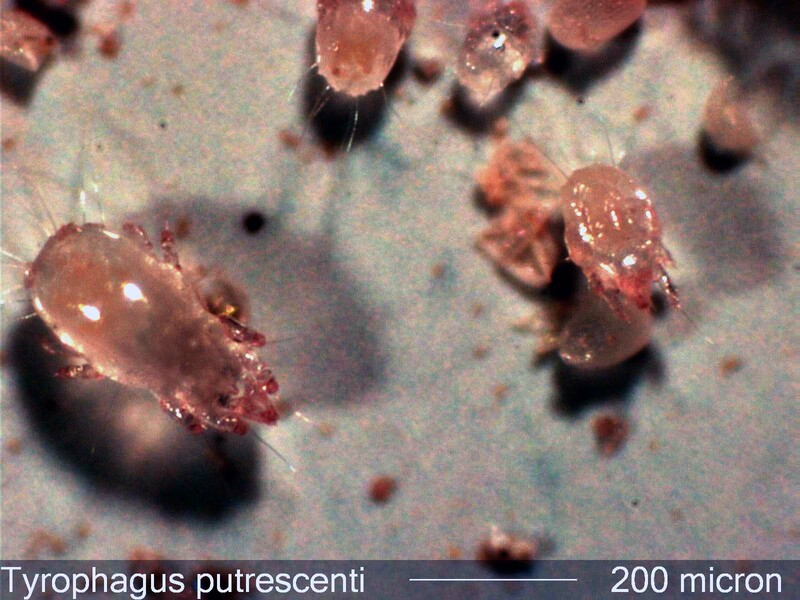 Mites or their debris are found in indoor environments frequently. They all tend to be small ranging from about 40 micrometers to about a millimeter in largest dimension. They lay eggs and then develop through a number of intermediate stages. The adult mite has 8 legs but the intermediate stages may have 2 to 8 legs, depending on the species and the stage. All mites require a relative humidity above 50% but they will often occupy cooler parts of a home where the relative humidity is naturally higher. They will also inhabit bedding and clothing where the relative humdity is elevated due to the presence of the human body. Their prefered food varies by species. Many of them will survive on skin flakes. Tyrophagus putrescenti was noted as causing health problems in humans as early as 1912 (Hughs, p. 42). Its allergenic properties have been studied recently by Arlian et al. (below) and others. There are over 124 different types of mites found in homes. Most of these are associated with allergies or asthma. The standard tests for mite allergen can only detect 2 of the 124 mites that may be present. The collection efficiency of a vacuum for even the 2 mites that could be detected is estimated at about 1%. Minor flucuation in that efficiency result in variations of a factor of 20X (2000%). Part of this variation is due to the fact that the mite allergen is often concentrated in a few large particles. The allergen of a few fragments would be swamped by the allergen associated with one whole mite. Tapelifts of settled dusts in homes have been much more consistent in detecting mite problems. Arlian, Larry G., DiAnn L. Vyszenski-Moher, S. G. O Johansson, and Marianne van Hage-Hamsten, “Allergenic characterization of Tyrophagus putrescentiae using sera from occupationally exposed farmers”, Annals of Allergy, Asthma, & Immunology, vol. 79, pp. 525-529, Dec. 1997. Bronswijk, J.E.M.H. and R. N. Sinha, Pyroglyphid mites (Acari) and house dust allergy, J Allergy, 1971;47:31-49. Colloff, M.J., T.G. Merrett, J. Merrett, C. McSharry, and G. Boyd, Feather mites are potentially an important source of allergens for pigeon and bungerigar keepers, Clinical and Experimental Allergy, 1997;27:60-7. Hughes, A.M., THE MITES OF STORED FOOD, Ministry of Agriculture, Fisheries, and Food, Technical Bulletin No. 9, 1961. Oliver, Jean, Karen Biringham, Angela Crewes, Jenny Weeks, Fleming Carswell, "Allergen levels in airborne and surface dust". INT. ARCH. ALLERGY IMMUNOL, vol. 107, pp 452-453, 1995. Olsen, Alan R. and Richard W. Potter, “Mites”, in FUNDAMENTALS OF MICROANALYTICAL ENTOMOLOGY, by Alan R. Olsen, Thomas H. Sidebottom, and Sherry A. Knight, CRC Press, pp. 123-134, 1996. Olsson, S. and M. Van Hage-Hamsten, “Allergens from house dust and storage mites: similarities and differences, with emphasis on the storage mite Lepidoglyphus destructor”, Clinical and Experimental Allergy, vol. 30, pp 912-919, 2000. Ryu, Jae-Sook, Han-Il Ree, Duk-Young Min, and Myoung-Hee Ahn, “A human case of house dust mite Tarsonemus floricolus collected from sputum”, The Korean Journal of Parasitology, vol. 41, No. 3, pp. 171-173, Sept. 2003. Silton, Richard P., Enrique Fernandez-Caldas, Walter L. Trudeau, Mark C. Swanson, and Richard F. Lockey, “Prevalence of specific IgE to the storage mite, Aleuroglyphus ovatus”, J. Allergy Clin. Immunol., pp. 595-603, Oct. 1991. Wraith, C.G., A. M. Cunnington, and W.M. Seymour, Th role and allergenic importance of storage mites in house dust and other environments, Clinical Allergy, 1979;9:545-61.